, the illustrious founder of New college, Oxford, was born at Wykeham in Hampshire in 1324. 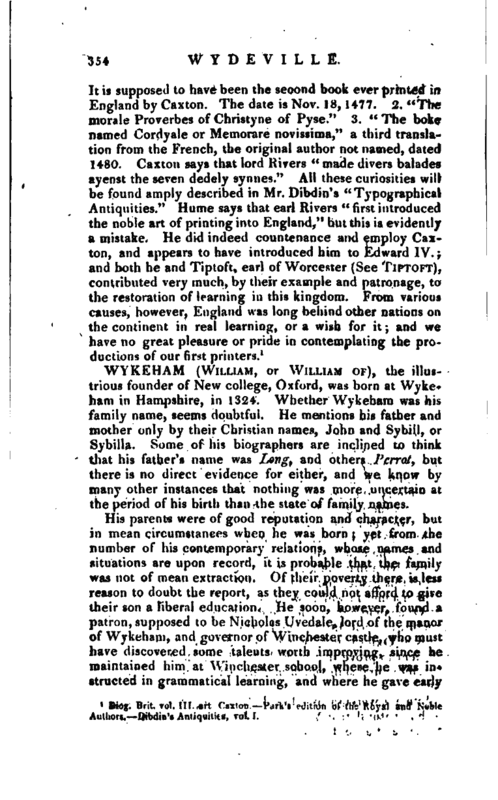 Whether Wykeham was his family name, seems doubtful. He mentions his father and mother only by their Christian names, John and Sybil), or Sybilla. Some of his biographers are inclined to think that his father’s name was Long, and others Perrot, but there is no direct evidence for either, and we know by many other instances that nothing was more uncertain at the period of his birth than the state of family names. His parent’s were of good reputation and character, but in mean circumstances when he was born; yet from the number of his contemporary relations, whose names and situations are upon record, it is probable that the family was not of mean extraction. Of their poverty there is less reason to doubt the report, as they could not afford to give their son a liberal education. 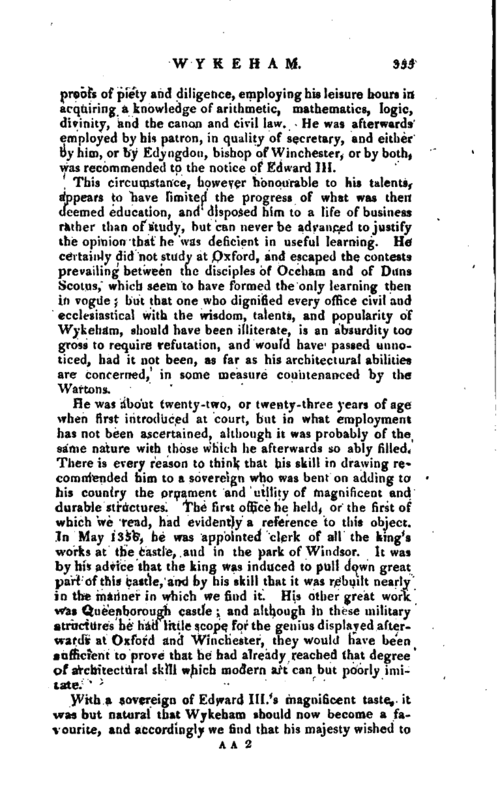 He soon, however, found a patron, supposed to be Nicholas Uvedale, lord of the manor of Wykeham, and governor of Winchester castle, who must have discovered some talents worth improving, since he maintained him at Winchester school, where he was instructed in grammatical learning, and where he gave early | proofs of piety and diligence, employing his leisure hours in acquiring a knowledge of arithmetic, mathematics, logic, divinity, and the canon and civil law. He was afterwards employed by his patron, in quality of secretary, and either by him, or by Edyngdon, bishop of Winchester, or by both) was recommended to the notice of Edward III. This circumstance, however honourable to his talents, appears to have limited the progress of what was then deemed education, and disposed him to a life of business rather than of study, but can never be advanced to justify the opinion that he was deficient in useful learning. He certainly did not study at Oxford, and escaped the contests prevailing between the disciples of Occham and of Duns Scotus, which seem to have formed the only learning then in vogue; but that one who dignified every office civil and ecclesiastical with the wisdom, talents, and popularity of Wykeham, should have been illiterate, is an absurdity too gross to require refutation, and would have passed unnoticed, had it not been, as far as his architectural abilities are concerned* in some measure countenanced by the Wartons. He was about twenty-two, or twenty-three years of age‘ when first introduced at court, but in what employment has not been ascertained, although it was probably of the same nature with those which he afterwards so ably filled, There is" every reason to think that his skill in drawing recommended him to a sovereign who was bent on adding to his country the ornament and utility of magnificent and durable structures. The first office he held, or the first of which we read, had evidently a reference to this object, In May 1356, he was appointed clerk of all the king’s works at the castle, and in the park of Windsor. It was by his advice that the king was induced to pull down great part of this castle, and by his skill that it was rebuilt nearly in the manner in which we find it. His other great work was Queenborough castle; and although in these military structures he had little scope for the genius displayed afterwards at Oxford and Winchester, they would have been sufficient to prove that he had already reached that degree of architectural skill which modern art can but poorly imitate. On the death of his old friend and patron William de Edyngdon, bishop of Winchester, in 1366, Wykeham was immediately and unanimously elected by the prior and convent to succeed him. Some delay having taken place before he c’ould be admitted into possession, it has been supposed that he was objected to by the king on account of his want of learning. 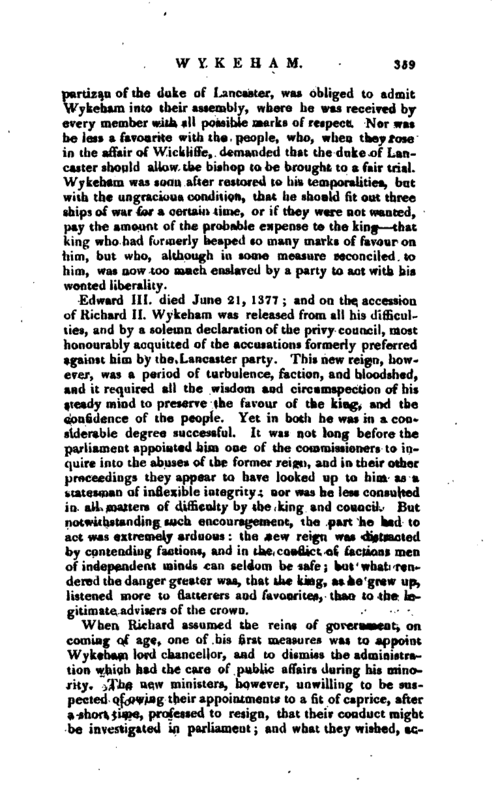 But this is utterly destitute of foundation, as it was by the king’s express desire that he was chosen, and what is yet more in point, the pope’s bull, contrary to the official language used at that time, and in which there was frequently no mention of learning, declares that Wykeham was recommended to his holiness, “by the testimony of many persons worthy of credit, for his knowledge of letters, his probity of life and manners, and his prudence and circumspection in affairs both spiritual and temporal.” The real cause of the delay is stated at great length by Dr. Lowth, and depended on circumstances belonging to the history of that age, connected with the general state of ecclesiastical patronage. His advancement to the bishopric was followed by his being appointed chancellor of England. In his speeches to parliament, it has been observed that he innovated on the practice of his clerical predecessors whose oratory savoured more of the pulpit than the bench, by introducing a style and manner wholly* political. In 1371, when the parliament, become jealous of churchmen, requested that secular men only should be appointed to offices of state, Wykeham resigned the seal, but without any loss of favour on the part of the king, the commons, or the public at large. The king was obliged to comply wiih the request to dismiss churchmen from the high offices of state, but soon found it necessary to have recourse to the only persons of that age whose education and talents seemed to fit them for such preferments. | Soon after his being settled in the bishopric of Winchester, he began to employ his architectural skill in the repairs of the cathedral, the whole expense of which was defrayed by himself, but his more enlarged designs for this edifice were delayed to a more distant period. 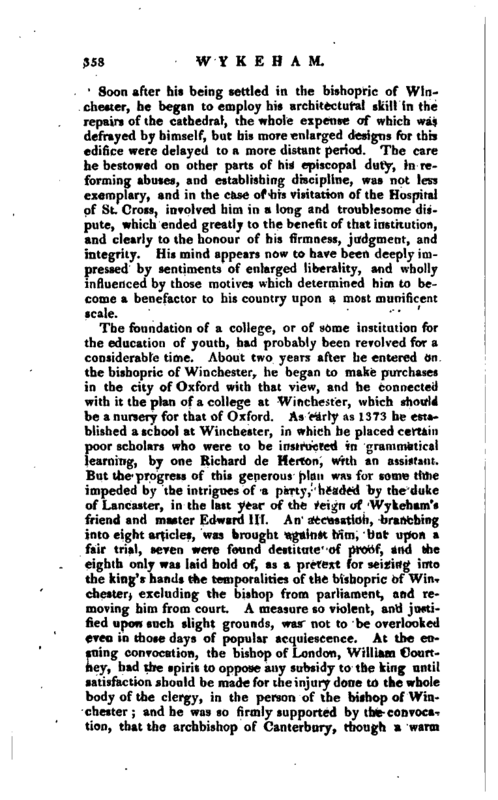 The care he bestowed on other parts of his episcopal duty, in reforming abuses, and establishing discipline, was not less exemplary, and in the case of his visitation of the Hospital of St. Cross, involved him in a long and troublesome dispute, which ended greatly to the benefit of that institution, and clearly to the honour of his firmness, judgment, and integrity. His mind appears now to have been deeply impressed by sentiments of enlarged liberality, and wholly influenced by those motives which determined him to become a benefactor to his country upon a most munificent scale. The foundation of a college, or of some institution for the education of youth, had probably been revolved for a considerable time. About two years after he entered on the bishopric of Winchester, he began to make purchases in the city of Oxford with that view, and he connected with it the plan of a college at Winchester, which should be a nursery for that of Oxford. As early as 1373 he established a school at Winchester, in which he placed certain poor scholars who were to be instructed in grammatical learning, by one Richard de Herton, with an assistant. But the progress of this generous plan was for some time impeded by the intrigues of a party, headed by the duke of Lancaster, in the last year of the reign of Wykeham’s friend and master Edward III. 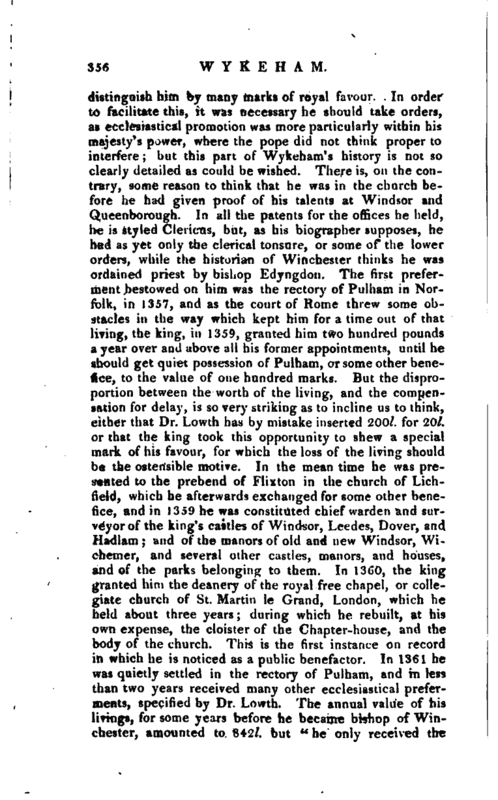 An accusation, branching into eight articles, was brought against him, but upon a fair trial, seven were found destitute of proof, and the eighth only was laid hold of, as a pretext for seizing into the king’s hands the temporalities of the bishopric of Winchester, excluding the bishop from parliament, and removing him from court. A measure so violent, and justified upon such slight grounds, was not to be overlooked even in those days of popular acquiescence. At the ensuing convocation, the bishop of London, William Courtney, had the spirit to oppose any subsidy to the king until satisfaction should be made for the injury done to the whole body of the clergy, in the person of the bishop of Winchester; and he was so firmly supported by the convocation, that the archbishop of Canterbury, though a warm | partizan of the duke of Lancaster, was obliged to admit Wykeham into their assembly, where he was received by every member with all possible marks of respect. Nor was he less a favourite with the people, who, when they rose in the affair of Wickliffe, demanded that the duke of Lancaster should allow the bishop to be brought to a fair trial. Wykeham was soon after restored to his temporalities, but with the ungracious condition, that he should fit out three ships of war for a certain time, or if they were not wanted, pay the amount of the probable expense to the king that king who had formerly heaped so many marks of favour on him, but who, although in some measure reconciled to him, was now too much enslaved by a party to act with his wonted liberality. Edward III. died June 21, 1377; and on the accession of Richard II. Wykeham was released from all his difficulties, and by a solemn declaration of the privy council, most honourably acquitted of the accusations formerly preferred against him by the Lancaster party. This new reign, however, was a period of turbulence, faction, and bloodshed, and it required all the wisdom and circumspection of his steady mind to preserve the favour of the king, and the confidence of the people. Yet in both he was in a considerable degree successful. It was not long before the parliament appointed him one of the commissioners to inquire into the abuses of the former reign, and in their other proceedings they appear to have looked up to him as a statesman of inflexible integrity; nor was he less consulted in all matters of difficulty by the king and council. But notwithstanding such encouragement, the part he had to act was extremely arduous: the new reign was distracted by contending factions, and in the conflict of factions men or independent minds can seldom be safe; but what rendered the danger greater was, that the king, as he grew up, listened more to flatterers and favourites, than to the legitimate advisers of the crown. When Richard assumed the reins of government, on coming of age, one of his first measures was to appoint Wykeham lord chancellor, and to dismiss the administration which had the care of public affairs during his minority. The new ministers, however, unwilling to be suspected of owing their appointments to a fit of caprice, after a short time, professed to resign, that their conduct might be investigated in parliament; and what they wished, | actually happened. The commons declared in favour of their conduct, and they were all restored. 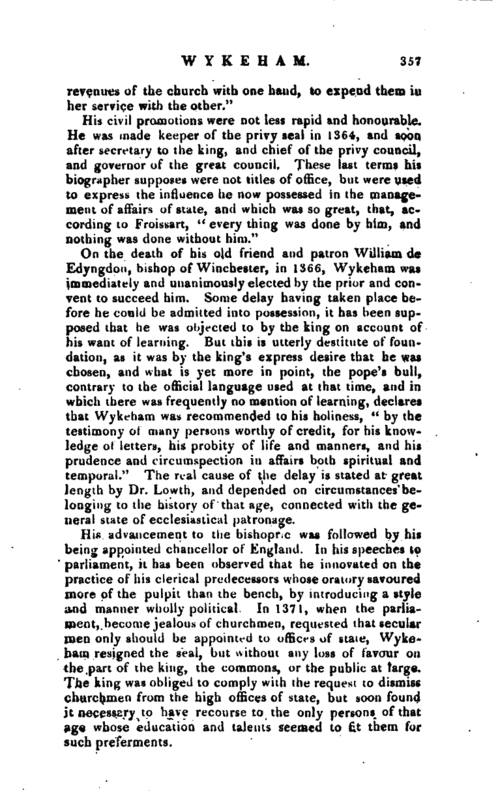 In conjunction with them, Wykeham had the satisfaction of being very instrumental in promoting public tranquillity, until his resignation of the great seal in 1391. After this he seems to have kept at a distance from the management of public affairs, and thus avoided the risk of countenancing those ruinous proceedings which led to the deposition of the king; and qluring the succeeding reign his age and infirmities afforded an excuse for his no longer attending as a peer of parliament. If we consider the importance of the undertaking begun at Oxford, and connected with a similar plan at Winchester, it will not appear surprising that he should, during the greater part of the reign of Richard II. have been disposed to bestow his whole attention on objects so dear to his heart. What he projected was certainly sufficient for the attention of any one man, and enough to immortalize the greatest. 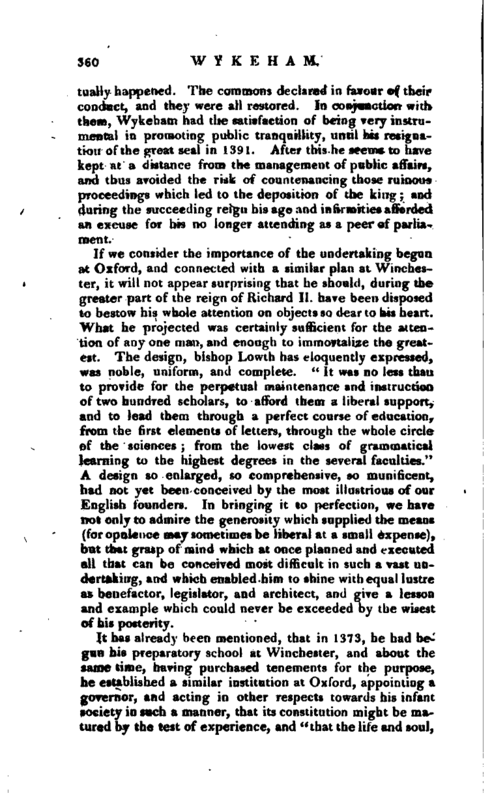 The design, bishop Lowth has eloquently expressed, was noble, uniform, and complete. “It was no less than to provide for the perpetual maintenance and instruction of two hundred scholars, to afford them a liberal support, and to lead them through a perfect course of education, fcom the first elements of letters, through the whole circle of the sciences; from the lowest class of grammatical learning to the highest degrees in the several faculties.” A design so enlarged, so comprehensive, so munificent, had not yet been conceived by the most illustrious of our English founders. In bringing it to perfection, we have not only to admire the generosity which supplied the means (for opulence may sometimes be liberal at a small expense), but that grasp of mind which at once planned and executed all that can be conceived most difficult in such a vast undertaking, and which enabled him to shine with equal lustre as benefactor, legislator, and architect, and give a lesson and example which could never be exceeded by the wisest of his posterity. Within less than three years from this commencement of his plan, the society consisted of a warden and seventy fellows, who were called Pauperes Scholares Vtnerabilis Domini Domini Wilhelmi de Wykeham Wynton. Episcopi. The warden had a salary of 20l. a year, and the fellows were lodged in the places hired for them, and then known by the names of Blake-hall, Hert-hall, Shule-hall, Mayden-hall, and Hamer-hall. The annual expense of their lodging amounted to iOi 13.S. 4d. ; and each was allowed Is. and 6d. a week for commons. In 1379, having completed the several purchases of land necessary for the scite of the college, he obtained the king’s patent or licenceto found, dated June 3.0, of that year; and likewise the pope’s bull to the same effect. In his charter of foundation which he published on November 26 following, his college is entitled Seinte Marie College of Wynchestre in Oxenford. But it is raxher remarkable that the name of New college, which was then given in common speech without much impropriety, should be by-some means continued until the present day, when it is in reality the oldest as to its principal buildings, and the seventh in the order of foundation. The foundation-stone was laid March 5, 1380, and the whole completed in six years; and on April 14, 1386, the society took possession by a public entrance accompanied with much solemnity. Among the seventy poor scholars (he founde-- orders hat his next of kin should have the preference, and that immediately on their admission they should become fellows without undergoing the two years of probation, as is the case with the others; and even should there be no vacancies at New college, they are allowed to stay at the college at Winchester till they have attained their thirtieth year, for the rhance of a vacancy, provided they have good characters, and have been proved by the electors to be sufficiently versed in grammar. 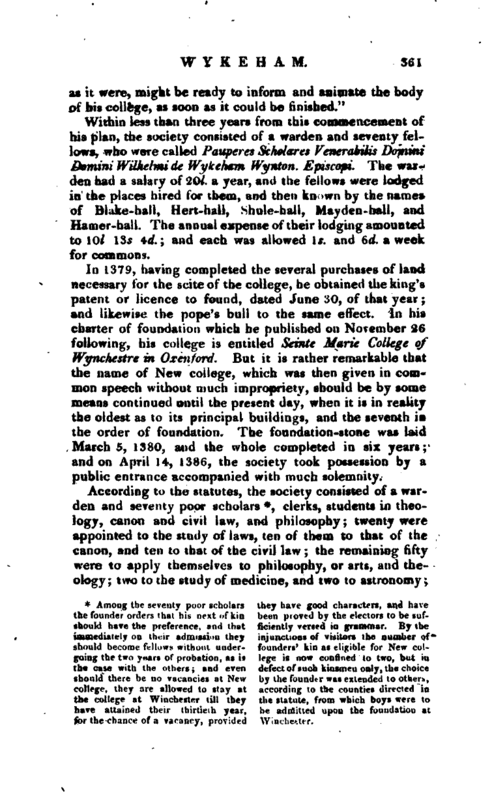 By the injunctions of visitors Jhe number of founders’ kin as eligible for New college is now confined to two, but in defect of such kinsmen only, the choice by the founder was extended to others, according to the counties directed in the statute, from which boys were to be admitted upon the foundation of Winchester. During the progress of the building, he established in form that society at Winchester which was to supply New college with its members. The charter of foundation is dated Oct. 20, 1382, and the college named Seinee Marie College of Wynchestrea. The year after New college was finished he began this other upon the scite where stood the school at which he received his early education. This, likewise, was completed in six years, with a magnificence scarcely inferior to that of New college, and was opened for the reception of its intended inhabitants, March 28, 1393. The society resembles that of his other institution, consisting of a warden, seventy scholars, to be instructed in grammatical learning, ten secular priests, perpetual fellows, three priests, chaplains, three clerks, and sixteen choristers: and for the instruction of the scholars, a schoolmaster, and an undermaster or usher. The founder of Queen’s college, by his twelve fellows, and seventy scholars, intended to allude to the apostles and disciples. The historian of Winchester informs us that the same design entered into the contemplation of Wykeham. The warden and ten priests represented the apostles, with the omission of Judas. The head master and second master, with the seventy scholars, denoted the seventy-two disciples, as in the vulgate, for the English bible, which is translated from the Greek, has only seventy the three chaplains, and three | inferior clerks marked the six faithful deacons Nicholas; one of the number, having apostatized, has therefore no representative; and the sixteen choristers represented the four greater, and the twelve minor prophets. From this school the society at Oxford was to be supplied with proper subjects by election, and the college aj; Winchester was to be always subordinate, both in government and discipline, use and design, to that at Oxford, and subject to a yearly visitation from the warden and two fellows of the latter. This visitation, and the annual elections from Winchester to New-college, generally take place in the second week of July. 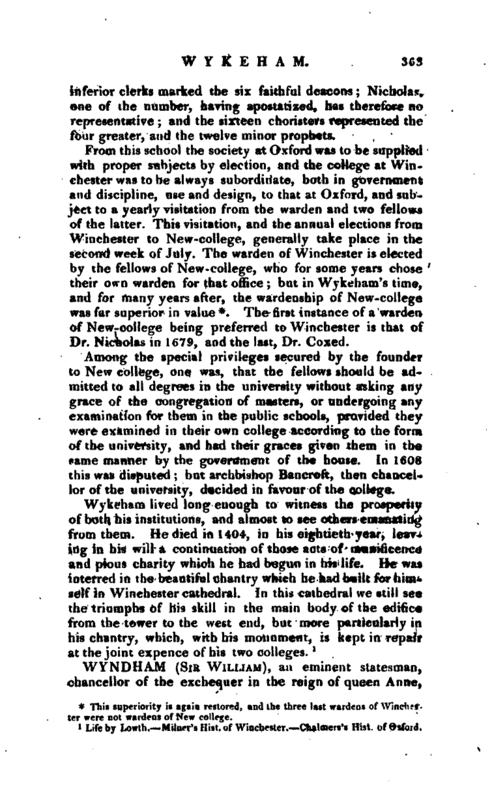 The warden of Winchester is elected by the fellows of New-college, who for some years chose their own warden for that office; but in Wykebam’s time, and for many years after, the wardenship of New-college was far superior in value *. The first instance of-a warden of New-college being preferred to Winchester is that of Dr. Nicholas in 1679, and the last, Dr. Coxed. 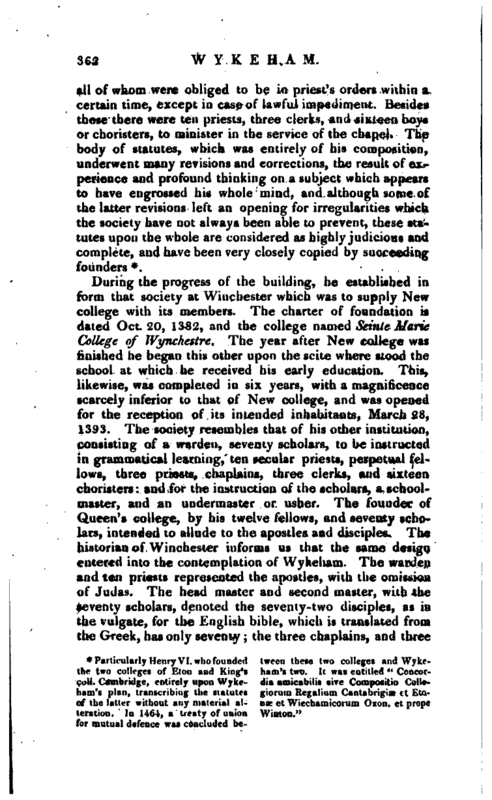 Among the special privileges secured by the founder to New college, one was, that the fellows should be admitted to all degrees in the university without asking any grace of the congregation of masters, or undergoing any examination for them in the public schools, provided they were examined in their own college according to the form of the university, and had their graces given them in the same manner by the government of the house. In 1608 this was disputed; but archbishop Bancroft, then chancellor of the university, dcided in favour of the college. Life by Lowth.—Milner’s Hist of Winchester.—Chalmers’s Hist. of Oxford.